The tactical member of the Micro family is compatible with all generations of night vision devices. Submersible to 80 feet. Ideal for rifles, carbines, shotguns, handguns and sub-machineguns. Integral Picatinny style base allows easy attachment to any rail. 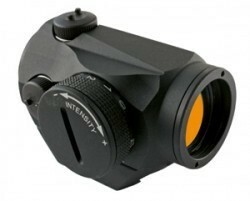 6 night vision compatible settings and 7 daylight settings and one extra bright setting for use with laser protection. Available only in the 4 M.O.A. Dot size.